Shoes – Before you decide on what shoes to wear, it’s best to research the terrain you will be hiking on. 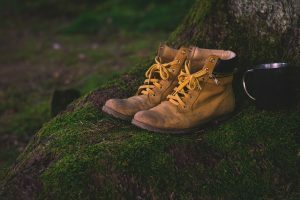 For short walks any type of trail shoes are acceptable but if you are going out for hours you might want to invest in a pair of hiking boots. Map – Most of the trails in West Virginia have a map of that specific area. Always bring a compass so you know which direction you are facing and can follow your map. Sometimes in the middle of nowhere, there’s no signal so bringing a GPS is not advised. Water – on long walks you might get thirsty so bringing water is a great idea. If you run out of water and plan on drinking from lakes or rivers bring a way to purify the water. Food – on long walks you will be burning a lot of calories and you will feel hungry. You do not want to faint. Extra clothes – if you get wet, if you get muddy or if it gets cold, having extra clothing on hand will be beneficial. Knife – you never know when you will need to cut strips of clothing to help bandage someone (if you forget the above item) or when you will need to cut branches or vines out of your way. Sunscreen – as you sweat the sunscreen begins to lose effectiveness. Reapply to make sure you stay safe. Backpack – to carry the above items!